Posted on October 11, 2018 in Dessert/Snacks. Created by Team MuscleEgg using Key Lime Pie MuscleEgg. Nothing is more refreshing than a cool Coconut Lime Smoothie after a tough workout. These might be Summer flavors, but they make for a nice escape during the cold fall and Winter seasons. 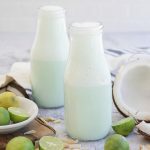 This coconut lime smoothie might be a simple recipe, consisting of only 4 ingredients, but it's not short on flavor thanks to Key Lime Pie MuscleEgg. Coconut and lime are a classic flavor combo that has been putting smiles on faces since before the Baja Men sang "Put the Lime in the coconut" and this smoothie is sure to do the same. Enjoy! Add all ingredients to a high speed blender and mix on high until light and frothy. Top with shaved coconut flakes and a squeeze of lime. Serving Size - 1 cup. Per Serving: Calories - 250 kcal, Protein - 15g, Total Carbohydrate - 4g, Total Fat - 18g, Fibre - 2g.